Source: Hardcopy courtesy of Crooked Lane Books. Thank you! When a pregnant car crash victim arrives at Stillwater General, ER nurse Frankie Stapleton and the team must work swiftly to deliver the baby safely. After hours of grueling effort, they finally save the baby, but the mother dies. The staff is already rattled, but then they learn that the accidental car crash was actually deliberate. Just when they thought the hard work was over, suspects begin rearing their heads one by one and no one is safe. There’s no shortage of motives. The victim was a social worker, and someone may have been seeking revenge. Or perhaps someone was trying to intimidate her up-and-coming politician husband. Then the baby goes missing. Now Frankie must race to uncover the truth in time to catch a killer and save a child in Lucy Kerr’s riveting second Stillwater General Mystery, No One Can Know. 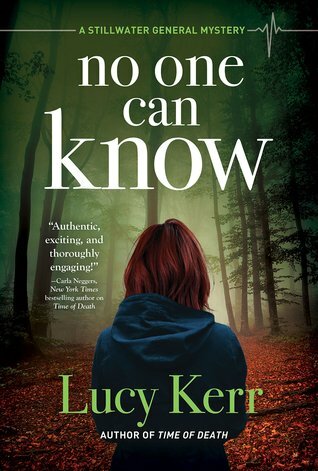 No One Can Know is the second entry in Lucy Kerr’s thoroughly entertaining and thrilling Stillwater General Mystery series. The debut, Time of Death, introduced readers to our protagonist: emergency room nurse Frankie Stapleton and her rather complicated return to her small hometown of Stillwater. In my review of Time of Death, I noted that I was captivated early on with Frankie’s voice and the series’ intriguing premise of combining suspense and murder investigation with medical emergencies and family drama. In No One Can Know, Kerr continues to excel with a tightly written mystery that manages to entertain, engage and keep the reader guessing all at once. Still experiencing the aftereffects of her involvement in investigating the death of Stillwater community member Clem Jensen, Frankie finds herself at the centre of another highly suspicious, horrendous tragedy. When Frankie and her ER colleagues try and save the life of a highly pregnant women involved in a car wreck, the case ends up being larger than anything Frankie or her colleagues could have imagined. As Frankie learns more about the mother who lost her life and the deceased’s husband- who has high political aspirations- she finds herself deeply involved in the case and unable to let go- much to the frustration of the Stillwater police officer heading the case (who happens to be her former fiance Noah). Frankie continues her own sleuthing into the increasingly tangled murder investigation and as the media frenzy surrounding the politician’s wife’s death grows, she discovers that Noah might need her help and support more than ever. As with Time of Death, Kerr does a great job here in combining relationship drama (both family and romantic) with elements of suspense and genuine twists. The ending of No One Can Know is one of quiet surprise and reveal, leaving a lot of room open for darker and bigger directions the series could take! Overall, a strong, more than worthy second entry in a solid mystery series that looks to have many more exciting and riveting stories in it. Though not absolutely essential to have read book one, I do recommend starting with Time of Death as it offers a lot of background and character introduction to Frankie, her family, and more details into her long history with Noah. Readers who enjoy amateur sleuth mysteries, medical dramas, or slightly darker cozy mysteries with a strong protagonist might do very well to check Lucy Kerr’s series out. Must Read Monday (78): YA titles from Emily X.R. Pan, Nic Stone, Melissa Albert & more!